Giveaway is closed. Congratulations to Marianne Gill, Brenda Champion, and Kim V! Brenda and Kim won in an additional giveaway for newsletter subscribers. Hey friends! 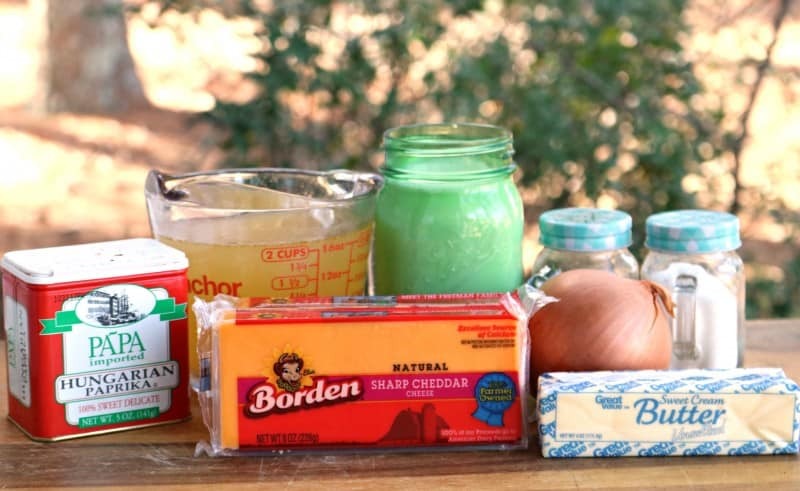 I’m so excited to be bringing you a recipe that my kids are excited to share today, courtesy of Borden® Cheese! This Cheese Soup is one of my kid’s favorite meals. They love that everyone can customize the flavor of their own bowl and they also love to make it as a family, which makes supper even more fun! To make this soup, you’ll need: Borden® Sharp Cheddar Cheese, Butter, Heavy Cream (or milk), Onion, Chicken Broth, Salt, Pepper, and Paprika. Note: It is best not to use pre-shredded cheese for this as it won’t melt as well as the block cheese will. 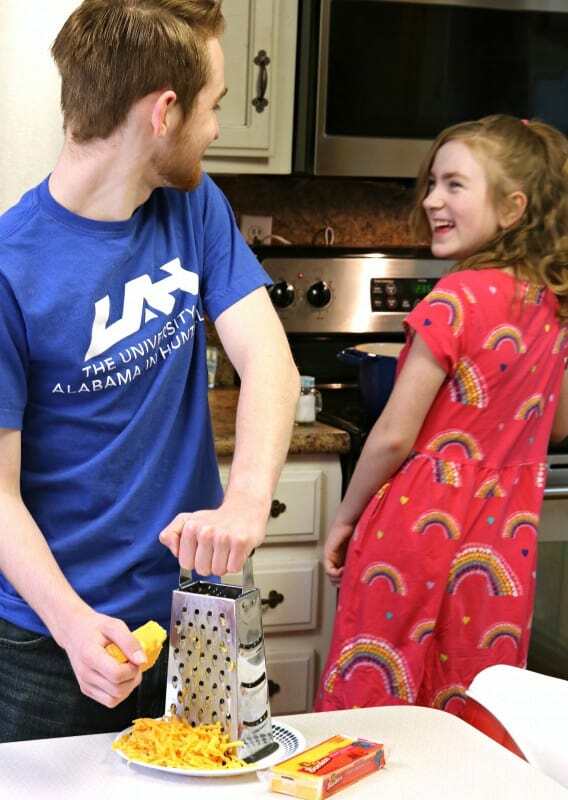 While Brady handles the cheese grating, Katy is getting started with the first step over on the stovetop. I am specifically using Borden® Cheese here because it is delicious, all natural, and is made by a cooperative of over 8,000 family owned dairy farms across the United States. The cheeses they offer include: Mild Cheddar, Mozzarella, Mexican, Swiss, Sharp Cheddar, American, Colby Jack, and more. They are available in singles, shreds, chunks, slices, strings, and snacks! This is creamy, flavorful, delicious cheese made in our homeland and it just makes every dish better. This is as simple as can be to make. Add onions and cook, stirring often, until browned. Add in broth, cream, and seasonings. Reduce to simmer and cook, stirring often, for about ten minutes. 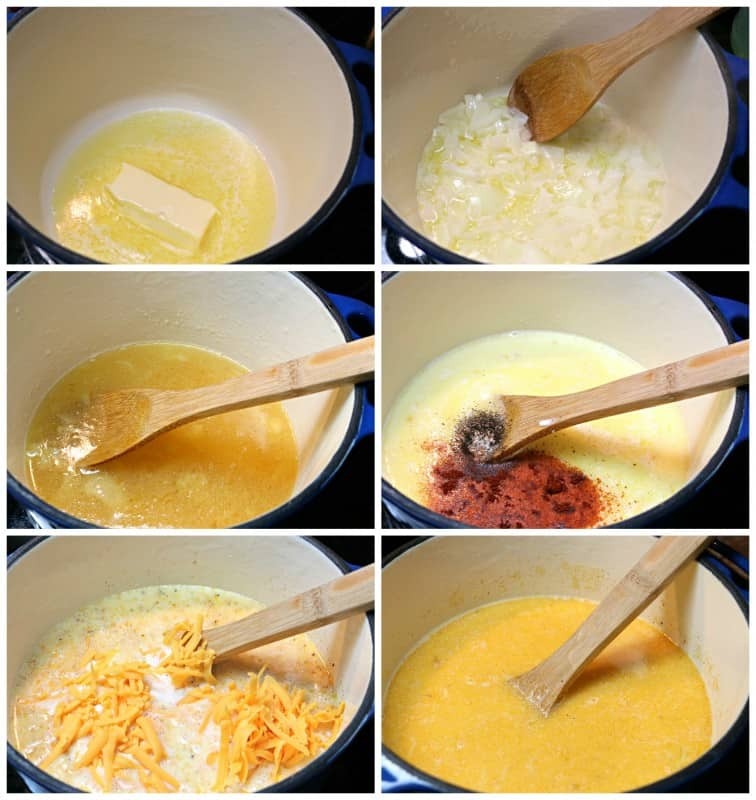 Add in shredded cheese and continue cooking, stirring constantly, until cheese is melted. Check out the video to see everyone adding in their favorite toppings. This is my bowl, with diced ham and steamed broccoli. ENJOY! In medium stock pot, melt 1/4 cup butter. Add onions and cook, stirring often, until lightly browned. Pour in broth and cream. Add seasonings. Reduce heat to low and simmer, stirring often, ten minutes. Stir in shredded cheese. Continue cooking, stirring constantly, until cheese is melted. Serve in bowls and allow family members to customize their own bowl with toppings of their choice such as: Pizza toppings and sauce, pasta, veggies, bacon, etc. The sky is the limit when it comes to mix-ins! Most anything that compliments cheese will be great in a bowl of this soup. Borden® Cheese believes so strongly in the power of family meals that they are joining with me to issue a dinner dare to each of you! Sitting down together as a family for supper is so very important, but schedules and busy-ness can often get in the way. Borden® Cheese is challenging you to sit down at least once per week as a family as part of their Dinner Dare challenge. If you will accept this challenge and carry it out this week, let me know by leaving a comment below! I’ll choose one person at random to win a $100 Visa Gift Card to help buy groceries for a delicious family meal! Disclaimer: Contest closes at midnight, March 27th. Winner will be chosen using random.org and notified by email as well as announced on this post by March 29. I am not responsible for emails that go into spam folders so please check back to see if you won. Winner has three days to respond to email or alternate winner will be chosen. Everyone who accepts this challenge ends up winning in a big way, though, because you get time with your family! This post is graciously sponsored by Borden® Cheese. All opinions are my own. Yes, good idea! I’m preparing dinner in the slow cooker tonight! Can’t believe how much they’ve grown. Family dinners are tough with my hubby’s work schedule, but we do the best we can. Eating together is very important to bring family together and share your day with each other. I promise to always each and everyday to try and do this for one meal be it breakfast, lunch or dinner. Your kids are so cute – love their smiles at each other! 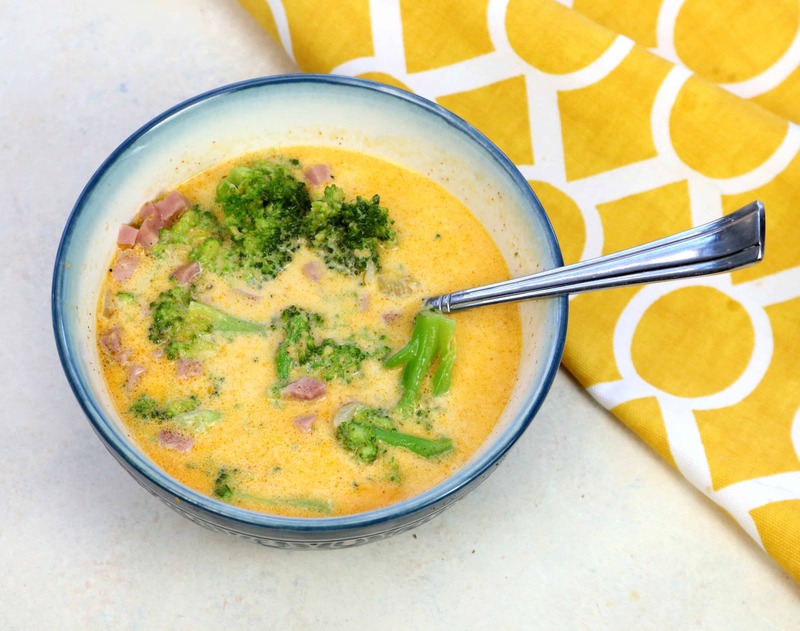 Love this soup with potatoes and a little diced bacon and broccoli too…. yumm! Family mealtimes are one of the highlights of my day! We are having a eat together of pizza with Borden Cheese for supper tonight. We try to all eat together at least 3 times a week. Hard to do because of schedules,but we make it work. This soup sounds great!! I’m a big believer in this. Family dinner is the glue that holds family together. We ear together every night, until baseball season starts! We still get to eat together at least 3 nights a week then too luckily!! Your kids are so grown! Been following since they were small! Thanks for the tip on Bordons cheese. Trying to eat healthier. I will accept the challenge! We try to eat together when ever possible! Love family dinners! Love to spend time with family around the kitchen table! It’s just the two of us, but we sit down at the table for dinner with each other quite often! My children are grown now but when we get together for a meal at one of our homes it’s always at the table! I like the pic of your kids! The soup recipe with options to personalize is a great idea. Spending time with family, especially sharing meals is a worthy goal. Family dinner time is crucial. We make sure it happens every evening. Just the 2 of us now, but we have dinner together.